Voted #2 Cigar Aficionado's Top 25 cigars of 2013! 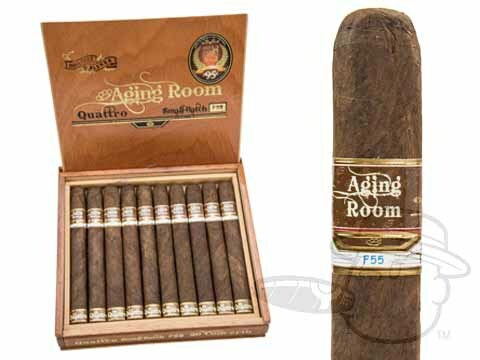 Boutique Blends' Aging Room Quattro F55 contains a blend of 100% Dominican-grown Habano-seed tobaccos beneath a 9-year-aged genuine Sumatra wrapper leaf. These highly-rated boutique handmades boast a bold bouquet of well-balanced flavor and a beautiful box-pressed burn on every stick. The Aging Room Quattro F55 Concerto imparts a full-bodied smoke with tones of earthy spice, coffee, cedar, nuts, and cream in a traditional 7x50 Churchill vitola. Excellent cigar...very smooth and sophisticated smoke. It was very flavorful and a creamy smoke when held in my mouth. It was a very enjoyable experience. Nice cigar, I would buy this one again. While I love my regular smoke (Padron Churchills) that are delicious, many many over the years, the most wonderful alternate (the F55 Quattro)is really incomperable and completely satisfying.! I bought the Quattro F55 Concerto based on its 95 rating from Cigar Aficionado. It did not disappoint me. The start had a slight bite but within a few minutes it smoothed out to a rich and complex bundle of flavors. It burned beautifully with a very easy draw. The last third did tend to require attention to keep it lit. It certainly stands with the best cigars at an amazing price. This cigar was a very pleasant smoke from beginning to end. The cigar had a great balance of flavor without being heavy or too strong. When I held the smoke in my mouth, it was almost "creamy". The burn and the draw were consistent from beginning to end. I highly recommend this cigar to folks that like a flavorful cigar without being to full-bodied to strong. Its a no brainer why this cigar came in 2nd in 2013 Cigar of the Year. Great Stick, No Complaints. Great stick I smoke average of 2 a day but for some reason this one makes me dizzy still it has good flavor just very strong. Great cigar! Smooth medium bodied cigar. Great construction and burn. Will be ordering more of these!!! Aging Room's Quattro is a winner. The F55 is a special cigar that has it all - it's well made, draws nicely and has great flavor. Can’t beat these cigars for the price. Not a long smoke but it was winter time. Can’t spend an hour outside. Aging Room Quattro F55 Concerto is rated 4.5 out of 5 based on 20 customer ratings.